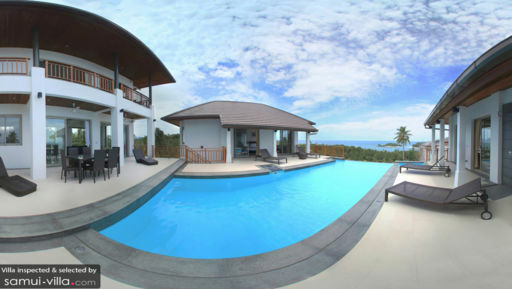 A tropical paradise where you can get stunning views of the sunrise and the sunset, Villa The Peak is found high on the Horizon Estate overlooking sweeping views of the sea and the luscious flora surrounding Choeng Mon beach and in the distance Koh Fan Noi. The villa comprises five bedrooms spread across three floors with balconies both in front and the rear offering spectacular views of the panorama. Whether you’re travelling with friends or family, you can choose to spend time on your floor as each of these is perfect for private and communal gatherings. Villa The Peak is home to five amazing bedrooms that are housed on each floor of the villa with the master bedroom located upstairs with balconies and glass doors on either side of its king-sized bed. At pool level, you have two bedrooms and the remaining two are located a step below with access to the rear gardens, a kitchenette and luscious views. The bedrooms are air-conditioned and well-furnished to give you a comfortable ambiance where you can rest and relax. 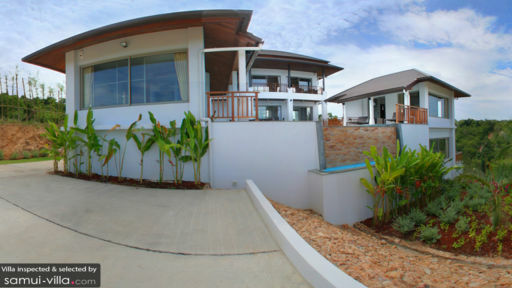 The front view offers panoramic vistas of the sea, so you can take your pick according to your needs. Ensuite bathrooms accompany each bedroom. The views from the infinity swimming pool at Villa The Peak will leave you speechless and in awe of nature’s splendour. The dazzling beauty of the turquoise ocean speckled with verdant green islands is bound to put you in a good mood. The sand-washed pool deck runs along both sides of the swimming pool houses with rattan sun chairs that allow you to relax against an ocean view and sunbathe. Towards the rear of the villa, you will find tropical gardens landscaped with perfection to incorporate each of the lush elements. Lounge outdoors with a good book, play some games and relish a delicious breakfast under the open sky. The open concept living area at Villa The Peak opens up on both sides through glass doors to allows stunning views no matter which direction you turn in. Designed with minimal furnishings, the living area houses a sectional sofa and plush armchairs, a wall-mounted TV with DVD player and the nature outdoors serves as your decoration. 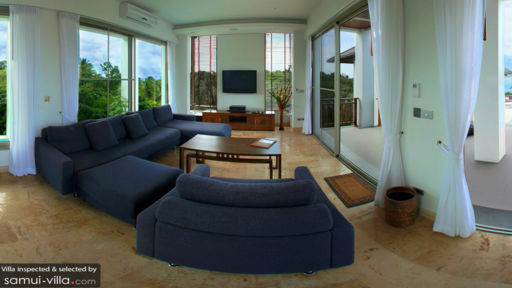 The villa living area is air-conditioned so you can spend hours idling away indoors simply enjoying the view. The terrace too is furnished with lounge chairs so you can enjoy the outdoors easily. Guests have the option to choose from indoor or outdoor dining depending on your mood. You can either enjoy an alfresco meal on the pool deck while gazing at a surreal ocean view or relish a meal in the comfort of your air-conditioned living space. The dining areas can accommodate all guests easily and you can enjoy dining partially indoors and outdoors to enjoy the best of both. A kitchen is available to guests and functional with modern amenities, granite counters and appliances for your use. An attentive and dedicated staff is at your service during you stay at Villa The Peak and since the villa is part of Horizon Estate, the services are world-class. They take care of housekeeping and maintenance of the pool as well as garden. The compound is guarded 24-hours and you can rest assured that you are in good hands. You have access to the estate fitness facilities as well. Choeng Mon beach is famous for its family-friendly shores where you can play with the kids, build sandcastles and have a jolly good time frolicking in the water. There are plenty of restaurants in the area to grab a bite to eat. Every Wednesday, there is the Choeng Mon Night Market with street vendors selling local wares and delicious treats. Chaweng beach is another famous spot with travellers for its beach clubs. Some other places you can visit include Big Buddha, Wat Plai Laem and Pagoda Khao Hua Jook.